Thank you to everyone who joined us for our annual awards evening recently. This was another fun evening and plenty to celebrate. Following a short business evening, we got down to the serious business. 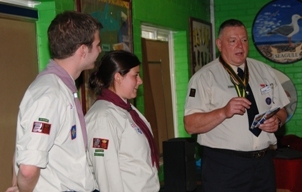 Abi Peett and Ed Harrison were presented with their Queen's Scout Awards and their Duke of Edinburgh Gold Awards. The Queen’s Scout Award is the highest that can be gained by anyone under the age of 25 and like the D of E award requires individuals to learn and make use of a new skill, undertake a physical challenge, demonstrating a significant improvement over a period of 6 months, complete a residential project involving working with people not previously known by them, give 9 months continuous service to the community and complete a 5 day expedition in wild country which they did earlier this year in Exmoor. In addition the Queen’s Scout Award required them to complete an International and an Environmental project and to have camped for at least 18 nights. 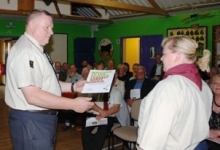 The awards were presented by Russ Parke, the Deputy County Commissioner for Scouting in Hampshire. These awards mean that both Abi and Ed will receive invitations to Windsor Castle for next year’s parade of Queen’s Scouts and to St James’ Palace for a special event for Duke of Edinburgh Gold Award holders.
. 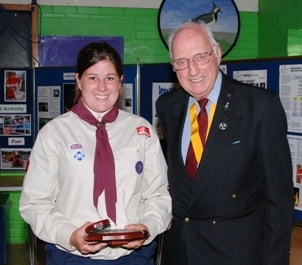 This year the award was presented to Abi Peett, who in addition to being a Scout Leader with Shark Troop, will often be found heloing with our Explorers and is also a Brownie Leader on the Island. Well done Abi. Presented to Mandy Hawke for her commitment over many years. 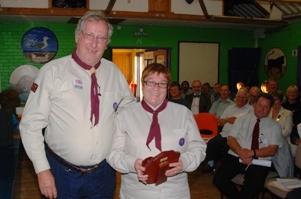 Jan Allgood was presented with her Wood Badge to signify successful completion of the adult training programme. The award was presented by Russ Parke. 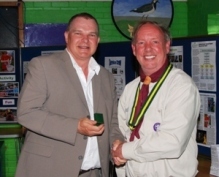 It gave me great pleasure to present a Scout Thanks Badge to Peter Rowson for all his help and support on our Executive Committee over many years and espcially his role as HQ Manager. 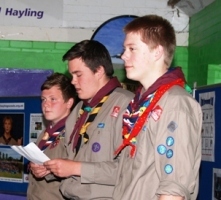 The last item on our Awards evening agenda was an update by the three Explorer's who will soon be heading off to Sweden, to join 40,000 other Scouts at the World Scout Jamboree. Well done to Jack Golden, Michael and Matthew Kenny. 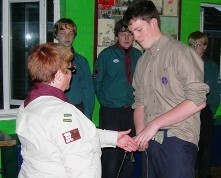 To gain their top award, Scouts are required to tackle a personal challenge. 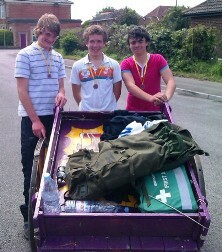 This year, Alex Kinsella, Harry Hick and Karl Ward all aged 14 and members of Eagle Troop complete the full 15 miles of the Lions Walk towing a trek cart. They completed the 15 miles in a record time (for the Scouts) of 3 hours 45 minutes. We would like to thank the Portsmouth and Hayling Lions for putting on a great event once again. Well done to Adam Saunders on completing his Young Leader training. Well done to the Scouts of all four troops on their camps, providing a wide range of activities and opportunities. Unfortunately this year we have seen a significant reduction in the number of people joining this fund raising event. We have therefore had to modify the number of prizes to operate within the rules laid down by the Lottery and Gaming board. You will all be receiving a letter asking whether you wish to continue with this reduction in prizes. Please can I ask you to respond as soon as possible. Thank You. Lion Troop help with Painting. Scout's from Lion Troop took their brushes and helped with the Mengham pre-school by painting their fence recently. Well Done Lions.